Just two years before this stunning T150C was built and a year after the C27 Voisin was built, Joseph Figoni and Ovidio Falaschi, Italian expatriates, formed a partnership that would lead the design revolution of 1930s into the 1950s. Figoni had already established himself as one of the leading practitioners of the automobile as art movement that was part of the broader French design revolution. With his keen interest in the emerging aircraft development, much of Figoni's worked had centered on aerodynamics, and his gift was to stylistically render airflow efficiency into sensuous aesthetic curves. This fascination gave birth to the iconic teardrop forms of the Delahye 135 and the Talbot-Lago T150C, perhaps the highest automotive design achievement of the streamline era. This particular 1937 Talbot-Lago T150C Figoni et Falaschi Coupé had gone through a restoration in Europe only a few years before. However, to compete at the level that this car was destined for, the new owner and his restorer, Bob Mosier, realized that a "complete" and authentic restoration was indeed required to even entertain a trophy at Pebble Beach. The car clearly had the pedigree to run with the Big Dogs at Pebble, but it needed the clear vision of a master restorer for that run. Happily, we were invited to participate in the restoration. For the woodwork, which was completely intact, this meant repairs, color considerations and the details of concours finishing. 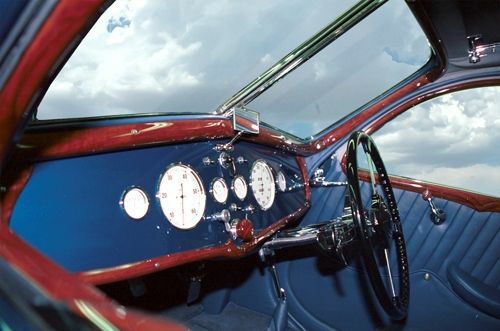 The wood appeared to be a European walnut that was designed to sculpturally outline the windows of the doors, the dash and windshield and the rear window. The door surrounds consisted of 4 pieces of walnut joined and glued to form the frame. The joinery was loose as one might expect after so many decades. The door wood was disassembled and the joints were cleaned. New splines were fitted and the wood was re-glued in the Talbot to ensure proper alignment. The characteristic Figoni and Falaschi details carved into the wood had gotten soft over time, and this was the perfect opportunity to sharpen their appearance prior to finishing. One of the concerns when finishing solid wood for the interior is the often times disparate shades of the lumber. Unlike veneer where all of the wood is selected from one bundle of veneer and the figure and color are virtually identical for each leaf throughout the bundle, solid lumber parts can have grain and shade variations. Even though this is the "natural" condition, it is desirable to have all of the wood look similar in terms of color and shade. There needs to be a "family resemblance" among the interior trim. This is sometimes a matter of bringing one or two pieces together with shading or tinting and other times may involve more sophisticated legerdemain. The European Class was highlighted by stellar entries including Ralph Lauren's Bugatti, Peter Mullin's Voisin C27 Cabriolet and Chip Connor's Talbot. 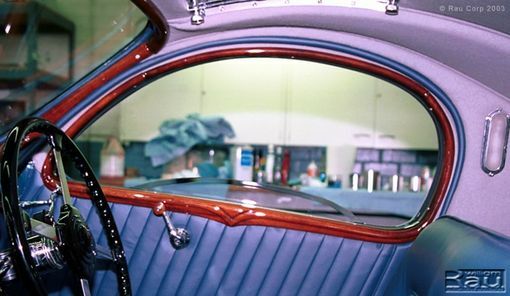 We were very fortunate to have participated not only in the wood restoration of the Talbot, but also the Voisin. The morning judging put order to the competitive field, leaving behind the Bugatti (2nd) and the Voisin (3rd) and placing the Talbot-Lago in the winner's circle with the 1st place finishers from the other classes; all hoping for further awards later in the day. And by days end, the Talbot was awarded Best of Show. With champagne in hand, we toasted the Best of the Best!